In January 2016, a report was published on the displacement situation in northeast Myanmar. 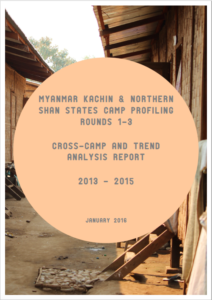 Based on data from a profiling exercise of the camp-based displaced population in Kachin and northern Shan states, the report provides an overview of the displacement situation over time and highlights differences between camps in Government and non-Government controlled areas. 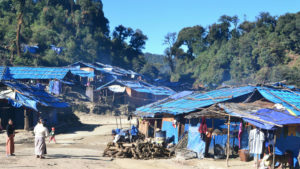 Led by the Camp Coordination and Camp Management (CCCM) Cluster in Myanmar, the camp profiling process started in 2013 with the aim of obtaining an updated overview of the situation within each of the IDP camps and to establish a common central information tool for the coordination of camp-level activities. Upon request of the CCCM Cluster, JIPS supported the set up of the exercise initially through a mission in 2013 that worked primarily on methodology and tool development, operational planning and training. A key outcome of this mission was a questionnaire developed jointly by multiple partners in order to feed specific and varied information needs. The process was designed to be implemented regularly, in order to update the profiling data for operational use and coordination. Since 2013, a total of three rounds of camp profiling have been conducted (2013-2015), with a fourth round currently underway. The continued implementation of this process is an indication of success but also of the continued need for the overview it provides. Camp profiling data has been made available through different channels, including the individual camp profile reports and an openly accessible database of information on each camp covered. In addition, JIPS has supported the operation to conduct a longitudinal analysis of trends over time based on data consolidated from all three rounds. Taking the analysis one step beyond the individual camp profiles, in 2015 JIPS collaborated with Statistics Norway to provide support to their partners in Myanmar for the analysis of the rich amount of data the profiling. This collaboration produced a cross-camp and trends analysis that was able to assess whether the situation in the camps had changed or remained stable over the last three years, as well as to identify any differences between the camps. The final report is intended for use primarily by the Shelter/NFI/CCCM Cluster partners and donors but also for the wider humanitarian community for strategy development and planning. The cross-camp and trends analysis compared large and small IDP camps in different locations (Government and non-Government controlled areas) and over time (between 2013 and 2015). The report shows trends in the demographic composition of the camps as well as changes in access to services (including shelter, food security, health, education, and protection). Although limited, it also provides an initial analysis on livelihoods and key gaps and priorities for response identified by both camp managers and camp dwellers. Read more about the camp profiling process and access single camp profiles. Read more about JIPS support and download cross-camp and trends analysis report.